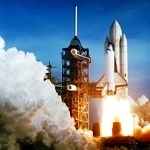 On this date in 1981, the first US space shuttle flight was launched. The flight of Columbia came 20 years to the day after the USSR launched the first cosmonaut into space. Explain your opinion about whether exploring space with humans is important enough to take the risks and spend the money.